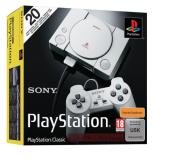 Sunday 21 Apr - Latest - Very (£49.99) and Currys (£79.99) currently have stock of PlayStation Classic. What is the PlayStation Classic? The PlayStation Classic is a re-release of the 1994 classic video games console from Sony. It comes with the same packaging, button layout, logo and is 45% smaller than the original. It also features a built in memory card which will save your adventures of the 20 pre-loaded games. Two wired controllers are included for multiplayer gaming. Where can I find PlayStation Classic stock? Use our unique stock listings to locate stock as soon as it becomes available at our panel of top UK retailers. Our servers are constantly checking for stock to ensure you are the first to know when availability is found. During busy periods PlayStation Classic stock can literally sell out in minutes, it's therefore crucial you know quickly when the stock is available to buy before it sells out. We constantly check for PlayStation Classic Console stock, so you don't have to. Receive email alerts when PlayStation Classic Console online stock is found.